If you are looking for a different kind of summer camp, check us out. Suances Teens Surf Camp has an intensive surf lessons and a whole range of beach, nature, and fun activities. A well-deserved vacation in the best place to discover a fantastic sport in a unique verdant and beach environment. A unique combination of nature, beach and entertainment where you can enjoy to the full your free time while you immerse yourself in the surf world. The seaside is a favorite summertime destination. If you want to mix some action, sport and good vibes, surf is the best choice you can make to have the ultimate seaside adventure. A perfect combination to make your well-deserved holiday a success. You will be embraced in a pleasant and friendly atmosphere from which friendships stems naturally from sharing breakfast, waves, and thrilling experiences. For balance, health and multiple activities. Surf is about Balance and we apply this concept to the whole project. We provide accommodation, surroundings and activities closely linked to the environment. One of our aims is to reduce the carbon footprint generated by our activity. A full breakfast with homegrown food, a sauna and water activities can be the key to a healthy holiday. We are a group of surf and nature lovers who dedicate part of our lives to accompany you in what fulfills and satisfies us the most: to reach that climactic moment when you surf the most intense wave and all of your problems fade away. we clean them on a daily basis to maintain our quarters dirt-free. Dome: 5 bunk beds making it an even 10 in total (The beds at the bottom are doubles or singles, while the beds at the top are all singles. Yurta:6 beds (double and single). A shared kitchen has all the necessary equipment to make any dish, with a cooker, an oven, a microwave and two refrigerators. The dining area is composed of 4 large gazebos, big wooden tables (and a surf table) and benches. Our old-school barbecue is laid at your disposition are for making amazing dishes. Small pond and a chill-out terrace ideal for contemplating, the beautiful green meadows of Cantabria with cave art from “the cave of witches” in the background. We have integrated bathrooms with indoor showers, as well as the original outdoor showers attached to the sauna to take a recovery-bossting contrast shower or a simple rinse after surfing with sunset views. A pylon for the sweetening of the surf suits after the courses. After rinsing, they will be left to dry in the air for proper maintenance. Indoor surfing material (slackline, longskates, indoboard, bosus) is used to improve your surfing on the mainland. A part of our camps, especially in the mornings, surfing will be the main activity. The camps are intended for both boys and girls who have never surfed and for those who have already had their first contact with the world of surfing or who already dominate the board. Also, back on land, we will complement activities such as the slack-line, the long skate, the surf skate and the review of the photos and videos to enjoy the best moments surfing while polishing failures. And many more things that you can’t miss! Lessons take place on three of Suances big beaches: Los Locos, the best beach in Cantabria according to the “Guide of Surf and Skate 2013”. The La Tablia beach, 10/10 according to “Surf Guide in Spain”, and the beach of La Concha for easier waves. You can take home a Surfbook illustrating your best moments on the waves and at the camp. We will start with the technique in the sand and the safety to continue with the practical development in the water. Afterwards, we will refine concepts about the correct standing, the choice of the best waves and the distribution of weights to maneuver in the board. All of the classes provide an explanation outside he water, a demonstration and technical practice on the sand. Everybody is given personalized advice on how to improve their techniques. The course finishes with a revision of all material covered during the camp. If you prefer bodyboarding you can improve your technique and learn with us. Surfing is an adventure activity which takes place in a natural environment and can be dangerous. In order to help you to surf and minimize the risks, we offer the best support with experienced instructors, small groups and Civil Liability Insurance. Suances Teens Surf Camp is located 15 minutes from Torrelavega, the second most important city in Cantabria. It has a bus and train station. It is also 30 minutes from Santander which also has an airport. In addition, it is 1 hour and 15 minutes from Bilbao. Suances Teens Surf Camp offers collection and transfer services for minors who come to the camps from Torrelavega, Santander and Bilbao. If you need it, get in touch with us. "The perfect place to disconnect, heal and be at one with nature. Los Locos Surf camp has been built with love and passion, it definitely shows! We had a wonderful long weekend despite it raining the first two days, the experience was very enjoyable and when the sun came out it was even better! We didn't want to leave. The family environment meant that we met other lovely people and bonded with them during our surf lessons and down time. It was really nice to switch off and relax in natural and quiet surroundings just minutes from the quaint town and beaches. Pablo and Javier did a fantastic job coaching us in the surf. Overall, great value for money, highly recommended and I will definitely go back again! " "I discovered this place by chance and I have never stopped coming back, 6 times in a year. I even took some of my friends there a couple of times. The environment is quiet and calm, the accommodation is simple and very clean, there is a barbecue and a small kitchen with a fridge. You can rent a board and a wetsuit and they also do surf lessons. The village is only 5 minutes walking. The owner and the staff will make you feel like home. This is a very lovely and charming place. Looking forward for the first rays of sunshine to come back!" 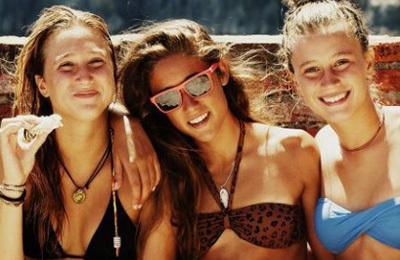 "We spent a week at Los Locos Surf Camp and really enjoyed it!! The camp is absolutely beautiful, surrounded by nature and there are loads of things to do. We really loved the atmosphere at the camp, we met some very cool and interesting people. I especially loved the fact that almost everything can be done outside, the feeling of the camp is very open, but you can also kick back in one of the tents or bungalows or meet in the common room/tent and talk, read, play some music or whatever else. Would definitely come back and thanks for the great stay! : )"